Located on the West Coast of Florida, about 60 miles south of Tampa, Sarasota County consists of 573 square miles extending from the Gulf of Mexico and Sarasota Bay to cattle ranches in the east. With more than 35 miles of beachfront, residents are within a 15-minute drive of the award-winning white-sand beaches. No longer just a tourist destination and retirement haven, Sarasota has become a diversified community with an expanding economic base, skilled workers and professionals, and one of the best school systems in the state. The cultural capital of Florida, it is known for its intoxicating cocktail of culture, from the Ringling Museum of Art, the state museum of Florida, to its own symphony, opera and ballet. 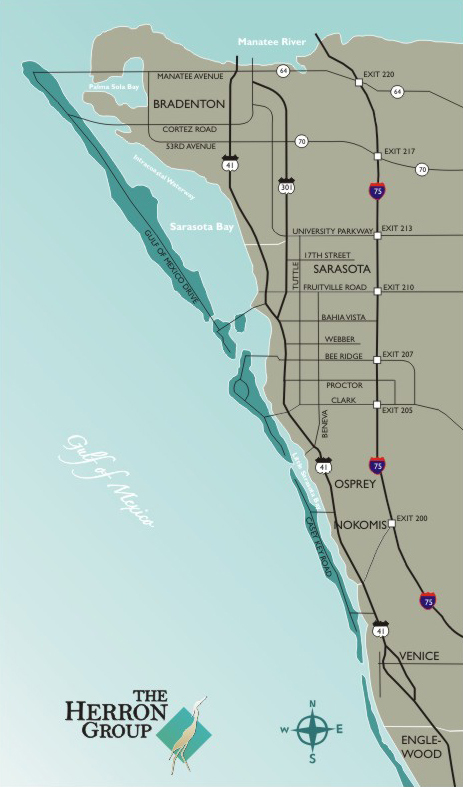 Sarasota County consists of Sarasota, Nokomis, Osprey, Venice, Englewood, Bradenton, Longboat Key, Lido Key & St. Armands, Bird Key, Siesta Key, Casey Key and Manasota Key. Each area of Sarasota County has its own personality, and our visitors are delighted to find more vacation variety here than they ever expected. The City of Sarasota, with its active downtown and arts and theater district, still has a friendly, small town feel. Luxurious Longboat Key’s manicured beach resorts and condos also offer world-class tennis, golf and dining. Laid-back Siesta Key has the feel of a tropical island, with sugar white sand officially designated “the whitest, finest beach sand in the world”. St. Armands Circle is home to gourmet restaurants and chic shops featuring the best items from around the world. Once known primarily as a vacation or retirement destination, today’s Sarasota is home to diversity. A great year-round climate, expanding employment opportunities, abundant leisure time activities and excellent schools attract creative entrepreneurs, skilled workers and professionals who want to thrive in a community where life is fun. Almost half of Sarasota County’s population is in the prime working age range of 25 to 64. No matter what your age or stage, there’s always something interesting to do in Sarasota.